Draper Days 5 K, 17:26 official chip time, the official gun time as we stand is 17:29, but it should be 17:27. 13th overall, 4th master. There were a couple of issues with gun times. First, for reasons that are clear to Greg (the race director) but not as clear to me even after he sent me a fairly long explanatory email, the timer was knowingly started about 2 seconds before the gun actually fired and not properly adjusted afterwards to account for the discrepancy (to be clear - I understood the need for the early timer start, just not the failure to account for it in the official results). I proposed a technical solution that would correct the gun times to within 0.3s of the true gun time and volunteered to execute it, but Greg has not yet gotten back to me on this. Another issue with the gun times is that very few runners were able to get to the true starting within 1s of the gun actually being fired due to the wheelchair start confusing. There were some runners pushing handicapped participants in a wheelchair. For some odd reason they did not have a separate start, and started at the front together with everybody else. So at this point we should probably throw away the gun times, and use chip times. Except for people whose chip did not register, for those we should just subtract two seconds. So I will report the times in this manner. So based on chip times our family got the following: Dad(44) 17:26, Joseph (12) 18:30 PR, Jacob (10) 19:00 PR, Jenny(16) 20:00 altitude PR, William (8) 21:37 PR, Julia (14) 21:45 PR, Stephen(6) 24:32 Debut, Mom(41) 24:33 second-fastest time ever with the PR (24:19) being set in 2002 when she had given only two births prior. I consider Sarah's 24:33 after ten kids my most significant coaching accomplishment. The kids have run some good times, they work hard, but I really do not have to do much thinking. They are young and fairly quick naturally, so just any reasonable consistent routine that does not overtrain them at this point will produce decent results. However, with Sarah both of us had to do a lot of learning. Her top 100 m speed is 19 seconds. She does not come from an athletic family and never did any kind of competitive sport in her youth, so pushing herself in a sport to her is a skill she learned after we got married. She started running consistently in 1999 shortly after Benjamin was born, and never stopped with the exception of near-delivery times in the earlier pregnancies, and the first few weeks of recovery after each. Now she runs to the day she delivers. Sarah and I have been through a lot trying to figure out how to keep her healthy and fit as she kept having children. We could probably write a book about it, and maybe some day we will. We were 5 seconds short of our 20:50 record. Though all of the kids have gotten faster and run PRs, Mom ran faster, and Dad was only a few seconds slower, replacing Benjamin who is now on a mission with 6 year old Stephen who suffered from a side stitch starting early in the race ended up having too much impact. So maybe next year, I would say barring something unusual definitely next year unless Sarah gets pregnant. As far as my race goes, I felt some fatigue from OpenWest Capture the Flag which I think cost me 10-15 seconds, most of it in the last mile. That is when I let go of James Moore, and Nan, and then Dennis (with a $20 bill figuratively attached to his back) passed me. Somehow I was able to hold off Sariah (17:29) and Jocelyn (17:31). I think just like me they were also suffering from a hard effort in the first two miles. 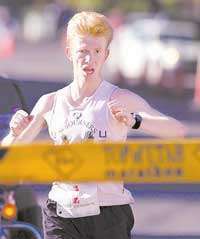 Nan ran a very strong last mile finishing in 17:04 and even passed Matt Wolpert (17:05) as well as James Moore (17:05). I think Matt and I had similar problems today. He was trying to keep Brad Barton (16:17) in striking distance. I was trying to keep Matt in striking distance. Amazing, you have many coaching successes to be proud of. I'll have to tell my wife the story you have about yours. You guys are really close to your family record!